In recent the Guangzhou Intermediate Court has made a first instance judgment in the trademark infringement case of Zhou Lelun (an individual) v. Xin Bai Lun Trading (China) Co., Ltd, the Chinese subsidiary of sportswear manufacturer New Balance Athletic Shoes, Inc. (hereinafter referred to as “Xin Bai Lun Company”). In the judgment, the court ruled that Xin Bai Lun Company shall pay compensation of CNY 98 million Yuan (approx. USD 16 million) to the plaintiff Mr. Zhou. It is extremely rare to have the judgment made unfavorable to an important multinational corporation. We believe a detailed understanding of his case can shed some light for multinational companies on the importance of protecting their Chinese trademarks in China. The following paragraphs contain our comments on this case. Guangzhou Intermediate Court had the jurisdiction for this case, as the plaintiff conducted a Field notarized Purchase in Guangzhou City and listed the retailer he bought from in Guangzhou as a co-defendant. The plaintiff submitted a lot of evidence to support his claim for the large amount of compensation. They were 7 Field Notarized Purchases in 5 different cities and 8 Website Notarizations. This evidence proved the prevalent use of “新百伦”(Xin Bai Lun in Chinese) mark and the claimed infringement conducted by Xin Bai Lun Company. Evidence preservation was used as a critical tactic of the plaintiff in support of his large claim for damages. Based on the application, the plaintiff successfully requested the court to preserve the financial proof of defendant’s profits of CNY 196 million (Approx. USD 32 million). This was also the major piece of evidence supporting the plaintiff’s claim of CNY 98 million (Approx. USD 16 million) in damages. In our opinion, the defendant’s venerable position in the first instance trial was the result of poor risk management of using “新百伦”(Xin Bai Lun in Chinese) mark. In 2007, New Balance Athletic Shoes, Inc. had filed an opposition against the “新百伦”(Xin Bai Lun in Chinese) trademark applied by the plaintiff. But the China Trademark Office made an unfavorable decision against New Balance Athletic Shoes, Inc. Unfortunately, the New Balance Athletic Shoes, Inc. failed to take all possible measures to delay the registration of “新百伦”(Xin Bai Lun in Chinese) trademark. We believe that if any of the following measures occurred: filing a review of opposition, a first instance administrative litigation or a second instance administrative litigation, it would have delayed the effectiveness of the “新百伦”(Xin Bai Lun in Chinese) trademark for at least 2 to 3 years. Without the successful registration of the trademark, the plaintiff would be more reluctant to file a civil claim against the defendant. 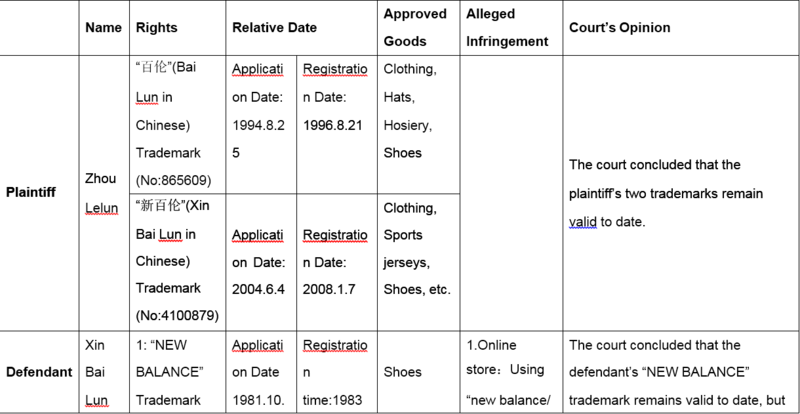 Judging from the facts, it seems that the New Balance Athletic Shoes, Inc. did not act comprehensively to stall or prevent the plaintiff’s registration of the trademark; it also underestimated the risk and the ultimately legal consequences. Xin Bai Lun Company could have managed the risk of continuing use of “新百伦”(Xin Bai Lun in Chinese) mark after Mr. Zhou successfully registered the “新百伦”(Xin Bai Lun in Chinese) trademark. Prior and continuous risk assessment, monitoring and management could have effectively reduced and/or avoided such high risk of using the mark. It is important to prioritize the defenses. We believe the prior use of the mark should have been the key point in the whole defense strategy of the defendant. Other defenses, such as the enterprise name right, the well-known product name right and the Chinese translation of the English trademark were not sufficiently supported by admissible and notarized evidence. A better strategy would have been to collect all evidence that can prove the prior use of the “新百伦”(Xin Bai Lun in Chinese) mark by the defendant and the certain influence of the mark. In the first instance trial, it is seen that the defendant only submitted a limited amount of evidence. The first-to-file principle is a basic principle in Chinese Trademark Law. Although bona fide use of unregistered trademarks is also protected by the Chinese Trademark Law, it sits in a secondary position to the first-to-file principle and requires extensive amount of evidence of prior use to support the claim. In the first instance judgment of the case, the court did not respond to the prior use of the defendant. This could be the major defense of the defendant in the second instance trial. The first- to- file principle of Chinese Trademark Law has created many problems for multinational companies in protecting their Chinese trademarks, especially for those which enter China in recent years. We hope the following advice will shed some light. Companies should register the Chinese trademark that they plan to use in China as soon as possible. This could be as early as the planning stage of entering the Chinese market. The registration of the trademark they want to use, but also register the Chinese trademarks that are similar to the key Chinese trademark or the ones could pose dilutive effects. The principle is to register one key Chinese trademark for use and other similar Chinese trademarks to prevent malicious registration and potential infringement. If the Chinese trademark which the companies intend to use in China has been registered by others, we suggest taking all measures to manage the risk of potential infringement. These measures include filling oppositions and reviews of the opposition or administrative litigation against the trademark applied by others. Also, companies can file non-use cancellations against marks registered after three consecutive years or declarations of invalidity of the registered trademark. Anonymous purchase of the registered mark could also be an option. If all above measures fail, companies should consider the trademark infringement risk in the future and phase out the use of the trademark including using a new mark to replace the trademark registered by others. Whether the key Chinese trademark that companies intend to use in China was registered or not, companies should preserve evidence of use of the trademark. Evidences can include products, packaging, promotional materials, invoices and sales agreements. Evidence of use of the trademark in various locations and time should also be preserved. This evidence would then constitute the core evidence to be used in support of trademark applications, oppositions and declarations of invalidity. In the meantime, such evidence could also be used to prove prior use in the event companies are accused of trademark infringement. Continuous trademark auditing from a comprehensive perspective is a crucial aspect in risk assessment and evaluation. Such measures can locate potential risks in the most effective way and can create an opportunity to address risks early on so as to strengthen the defensive capacity of company’s position in the market. Late responses can exacerbate the situation because of the first-to-file principle in China. It is evident that the plaintiff’s investment in evidence collection and preservation greatly assisted him in obtaining the record breaking damages awarded. The plaintiff conducted multiple Website Notarizations and Field Notarized Purchases. He also applied to the court for evidence preservation and provided numerous other evidence to support his claim. The plaintiff received a notably high return that was much higher than his investment in preparing evidence to support his claim. Support from a professional legal team is very important for companies to operate its business in China due to the market’s fast-changing legal and business environment. With the growing of the Chinese market’s complexity, it is recommended to include a local team of legal professionals who also understand the business of the client and the complexity of the Chinese market. A leading IP firm in China would have abundant experience in working with multinational companies and would be able to provide effective, adaptive and practical legal solutions.